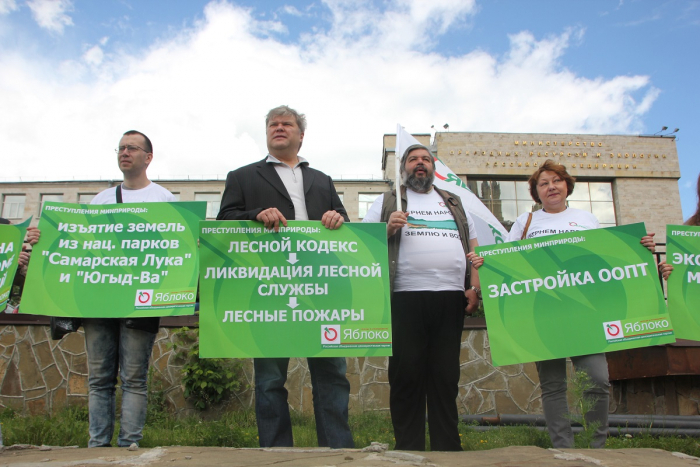 On the Day of Environmental Protection, 5 June, the Moscow branch of Yabloko will hold a picket against cutting down of city parks. The picket will be held by the office of the Ministry of Natural Resources and Ecology of the Russian Federation. Sergei Mitrokhin, Chairman of the Moscow Yabloko, will take part in the action. The picket will be held under the slogan “Stop cutting down city parks!”. The participants of the picket will oppose unlawful development of the Losiny Ostrov National Park in Moscow, where the GrandNext company is going to build a housing complex, and against cutting down of woods in the Kuskovo Park around the Kuskovo mansion as the city government plans to build a highway via part of the park. However, the Kuskovo Park has the status of a monument of landscape art of the 18th century, also the Church of the Assumption, a 360-year-old church, which is the object of cultural heritage of federal significance, is getting into the construction zone. Residents of the city of Cherepovets, who oppose cutting down of the 100-year-old Pulov Forest, will also participate in the picketing. The action will start at 1 p.m. Participants will gather at 12:45 at the exit from the metro station Barrikadnaya.